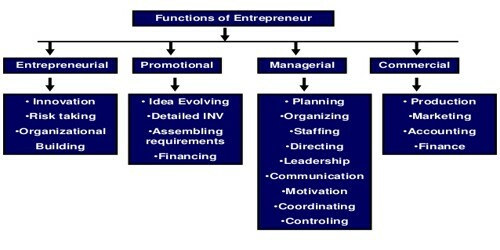 Entrepreneurial qualities consist of vision, inspiration, creativity, risk taking and achievement orientation. An entrepreneur is a visionary individual who takes risks by starting a new venture through assembling and coordinating various resources for the sake of uncertain rewards. Setting goals: Goals are set for new venture which can be in terms of growth, profit, leadership and services. Goals are set for long-term. Developing business plan: Business plan is developed for the new venture which consists of action plans related to production, marketing and finance. Contingency plans are developed to cope with risks. Grouping of tasks: Tasks required to achieve goals are defined and they are grouped into positions. Authority and responsibility of each position is established. Coordination: Coordination is the key to entrepreneurial success. So, mechanisms are established to achieve harmony of efforts. Financial resources: Financial resources can be existing resources of the entrepreneurs or can be mobilized from friends, relatives, banks or other sources. Human resources: Entrepreneurs acquire the needed human resources to fill-up the positions provided in the organization structure. Technology resources: Entrepreneurs deal with new technologies. They establish production facilities and procure machinery and equipment. They upgrade technology to keep up with technological changes. Exchange relationship: They are related with procurement of inputs and marketing of outputs. These relationships are mainly concerned with suppliers and customers. Exchange relationships are business oriented. Professional relationship: Entrepreneurs manage professional relationship within the venture. This is essential to motivate employees for higher productivity. They provide leadership and tackle labor problems. Such relationships are with employees, bankers, insurance companies, accountants, lawyers and consultants. Government relationship: Entrepreneurs manage relationship with government and regulatory agencies to get licences, facilities, financing and tax concessions. Dealing with public bureaucracy is an important function of entrepreneurs. Social relationship: Membership in clubs, professional associations and relation with local community are used to manage social relationship. Financial control: Entrepreneurs ensure proper allocation and utilization of financial resources which is needed to control cost and minimize wastage. Production control: Entrepreneurs achieve proper combination of inputs for production. Quality control is ensured and efficiency is improved. Managerial control: Entrepreneurs ensure management control in the new venture. They make key decisions themselves to solve problems. How to Solve a Linear Inequation Algebraically?